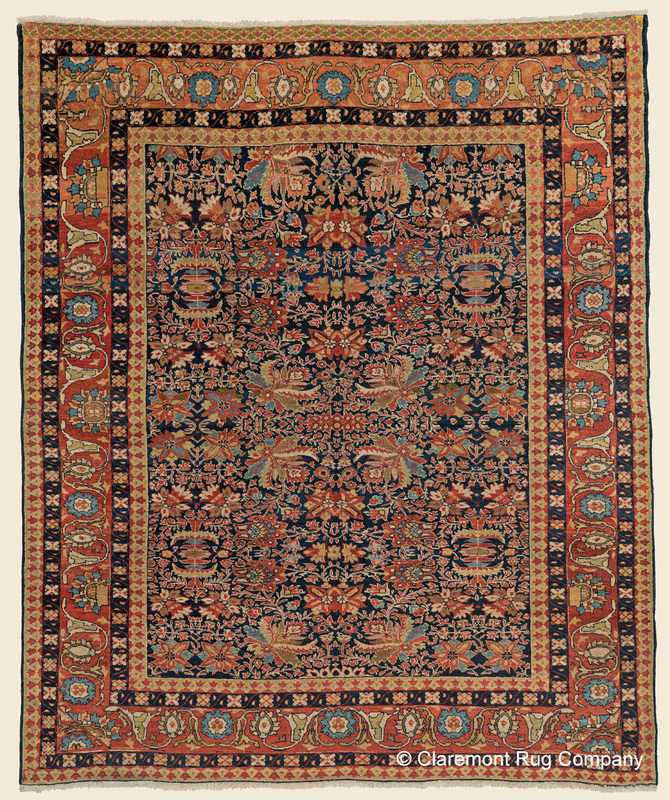 Search Our Inventory / All Rugs / 8&apos; 6" x 10&apos; 2"
8&apos; 6" x 10&apos; 2"
(Connoisseur-Caliber) Seldom do we see an antique Sultanabad carpet with this level of sheer creativity. The palette is extraordinary offering Chinese red, tropical guava, aquamarine, apricot and golden sand on a mostly hidden cobalt blue field--all of which is illumined by the lanolin in its fine grade of wool. The allover field design is astonishingly dense and as fascinating as a lush, abundantly watered and lovingly tended English garden. Note how the spacious, almost languorous procession of the ancient split palmette meander in the stunning main border deftly serves as a foil to the many striking motifs of the field.